The view from atop Kellys Mountain that overlooks St. Ann's Harbour and Cape Breton Highlands National Park in Nova Scotia, Canada. On a clear, summer day with only thin wisps of clouds floating by, the view is beautiful from St Ann's Lookoff on Kelly's Mountain in Cape Breton, Nova Scotia in Canada. Green fields and hillsides adorn the landscape in the foreground and across the horizon, you get a spectacular view of St Ann's Harbour and Cape Breton Highlands National Park. 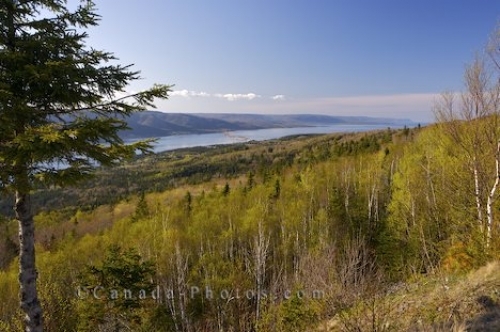 Looking across St Anns Harbour to Cape Breton Highlands National Park from the St Ann's Lookoff on Kelly's Mountain, Nova Scotia, Atlantic Canada, Canada. Picture of Cape Breton Highlands National Park and St Ann's Harbour in Nova Scotia from a view point on Kellys Mountain.